Posted 26 December 2010 in Bonus, Cooke Looks, The New Gods #2. 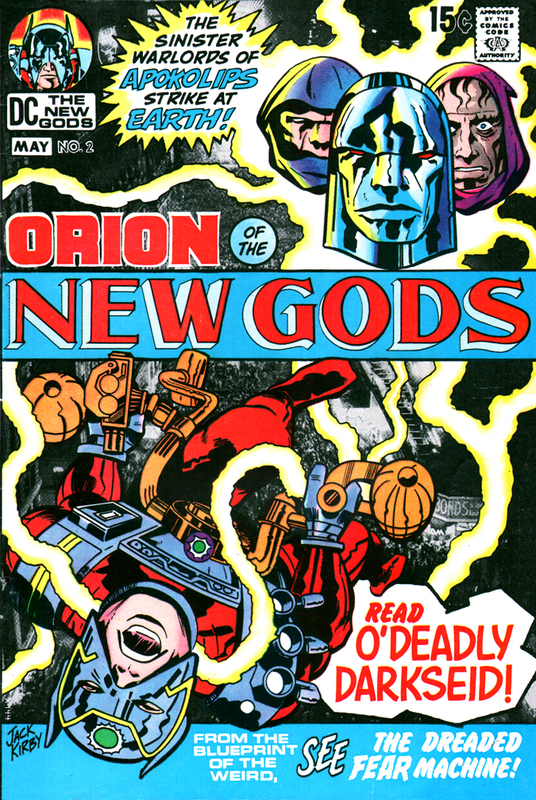 The creator is still setting the scene initiated in the debut number and, again, it’s a spectacular vision — the opposing worlds of the new gods on page one (note the para-demons flying above Apokolips! ), the idyllic paradise of New Genesis on the double-page spread that followed, the Moses-like majesty of Highfather conferring with Lightray (sporting a one-time only metallic mask that is especially groovy), and Darkseid himself aloof in a chair with an Earthling’s humble apartment before disappearing (Orion says to his allies, staring intently on that piece of Dave Lincoln’s furniture: “As for the arch-enemy of all life — you have seen him –! That empty chair still reeks of his presence!” Will Murphy’s Oil Soap take care of that stench, ya think? )… Too much! Brola and His Hand of Stone…? Well, not much to brag about but the Fear Machine is impressive! Most of all though, Darkseid is (umm) set in stone as a character here and the hints of Orion’s origin, mayhap as one born on Apokolips, adds a fine texture. Two thumbs of stone up!